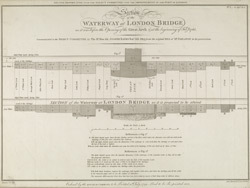 This plan, commissioned by the House of Commons, features proposed alterations to the central arch of London Bridge. The architect intented to widen the arch by reducing the width of the protective pilings ('starlings') on each side. Support would be added to the structure by filling in the locks around the support struts.